Oath of the Gatewatch, Uncommon. Strangely, this was the card from the Oath of the Gatewatch spoilers that had me most interested when I first saw it. I never would have expected that I would get all hype over an uncommon, but look at this guy! 3 mana for a 2/3 is reasonable, he’s in two workable tribes in being both human and a wizard, and then there’s that ability that triggers when he enters the battlefield. Bouncing an opponent’s best dude is great when it’s attached to a creature, but that added part about that player not being able to cast spells with the same name as the targeted creature until your next turn is beautiful (and great design in my opinion). Now, these opinions were my initial ones upon Reflector Mage being spoiled. I had no idea of the evil that it would commit in the present. 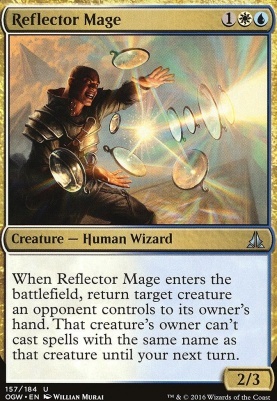 Since it is such a cheap creature, Reflector Mage finds play in just about every format it’s legal in, and in fact was recently one of a few banned cards for the standard format (the first such banning in quite a long time). In limited, where removal is king and card advantage so important, he fits in great. He’s great against aggro decks in both limited and standard (or was, at least) since he keeps copies of cards from being played, not just the initial target. That can buy you some very important time. And then there’s EDH/Commander. Boy, have I done some evil things with Reflector Mage in my favorite format. Flicker decks, tool box decks, general control decks, they love this guy. Right now, I see him as a terrific Commander killer. Since hiding your opponent’s commander in their deck is no longer a thing, the ability to get rid of it and keep it gone for as long as possible is just spectacular.